The Steeldrum, or "Pan" as it is colloquially termed, was invented on the Caribbean island of Trinidad some time during the 1940s. During the 1700s, British colonists had brought slaves to the island from West Africa, from what is now Ghana and Nigeria. The slaves brought with them as much of their culture as they could manage, including the tradition of drumming. Obviously the island did not provide the same materials with which to make and maintain drums as in Africa, and the slaves looked for substitutes. The most obvious and widely used was lengths of bamboo stamped on the ground or strugh together. These were known as Bamboo Drums or "Tambour Bamboo" which became corrupted to "Tamboo Bamboo". The problem with Tamboo Bamboo was that after extensive use, the bamboo split or broke. This led to a further substitution some time in the 1930s. This time paraffin tins, galvanised dustbins and the like were played with sticks. Some time during the 1940s - the exact date is not known - a guy by the name of Winston "Spree" Simon was playing a tin as a bass drum. As he beat it repeatedly with a stick the end of the tin gradually dented in, which caused the pitch of the drum to sharpen. Eventually he found himself playing a bass-drum part on a high pitched instrument. He picked up a rock and stamped the end of the drum back out from the inside, reasoning that if the dent was again made flat it would regain its bass note. 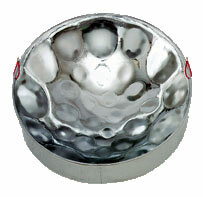 Or course, the end of the drum did not return to its flat state - instead it dented outward into three distinct bumps. Spree discovered that each bump made a different note. He went around playing "Mary had a little lamb" and the first steeldrum was born. The idea was rapidly developed and by the early 1950s the 44-gallon oil drum was the standard starting point. Instruments had been divided into those for melody, chords, and bass, and simple tunes or even classical music could be performed entirely on the steeldrum. There was intense rivalry between bands, often leading to bloodshed. The upper classes frowned heavily on pan-man, who were seen as hoodlums at best, and attempts were made to outlaw the instrument. The instrument (and its image) has been refined and improved, and a modern steelband can have anything up to 120 members. The instruments produce a most pleasing, clear sound, and a band has a range of nearly 5 octaves. Reportoire ranges from brilliantly executed classical music to pop to the vibrant calypso/soca music of Trinidad. Anyone who has heard a steelband in full cry will agree that it has a claim to being the 8th wonder of the world. This group formerly led by Keith C. St. Louis of Trinidad and Tobago came to Virginia under the name of Trinidad and Tobago Pan Professionals in 1994. They worked with inner-city kids from 1994 in the Portsmouth area and continue to do so now. One Love Caribbean Steel Drum Band is a complete steel drum band. 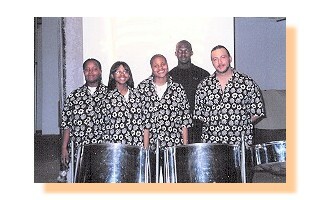 The band consists of five professional steel pan drummers. Instruments include: tenors, double seconds, guitars, six bass, and an electronic or acoustic percussionist. Their formal and informal venues include private parties, weddings, corporate functions, boat cruises, school presentations, social centers, college dances and festivals. We specialize in wedding ceremony music, cocktail hours, receptions, and rehearsal dinners. A Taste of Summer - Steel Drum Band at Wedding from Matt Davis on Vimeo. One Love Caribbean Steel Drum Band is available for all occasions. They enjoy what they do and they know you will too. Performances can be tailored to the needs of the client and are great for parties, church programs and meetings, as well as educational programs. If you only want one steel drummer or a whole band we can accommodate your needs. World Market 5225 Settlers Market Blvd. Wyndham Hotel Oceanfront, 5700 Atlantic Ave.
"Leave it at the Door"
I can't thank you enough for the awesome performance. I truly appreciate everything . . . . we've gotten so many compliments on how the music was the most perfect touch for the ceremony. Please let the other members of the band know how appreciative we are and let them know that they did an awesome job. We love the band, the music is excellent. I am glad to do a testimonial. Please feel free to call and stop by any time you are on the Outer Banks. I am not only pleased, but impressed with One Love Steel Drum Band! What a talented group of musicians! Everyone at the wedding had nothing but wonderful things to say about you all. I feel your music and enthusiasm made our beach wedding that much more special. It was an element of the day that will NEVER be forgotten. I noticed you will be laying on the 31st stage at the oceanfront a few times this summer. We will be sure to come over. Thanks again for all your hard work and making my special day so enjoyable!!! Everything was just fine. The band members were very pleasant and played well all evening. They were a good addition to our theme and everyone enjoyed them. "The sounds of the drums were beautiful. The steel drums made the party. I felt like I was in the islands. The ladies came right on time. They played songs that everyone knew. I now know who to call when I need steel drummers for an event. Thank you very much." "The band was wonderful. The band members are so nice and all our guests enjoyed the selection of music. My son said it was the best party ever and loved the music. It was so nice to drive up after graduation and to see the band set up and ready to play. I was so glad I did not have to worry about anything. Your band members looked so professional with matching shirts and truly gave us their all. We look forward to having you for another event and will highly recommend One Love Caribbean Steel Drum Band. Thank you for the wonderful graduation memories." "The band was fantastic. Really made the party. They set up early and got right to it. Thank the drummers for me." "You guys did a wonderful job! I tell everyone that the band was my favorite part of the wedding. Everyone said they just enjoyed listening to the music and a few asked me if you sold CD's. Also someone told me that people from the other wedding were coming over to listen to you guys. One Love is a great band and my favorite part of my wedding! Your performance at our wedding left an everlasting memory on me and my husband and for everyone that attended. I wish I would of booked you guys for the entire wedding not just the ceremony." 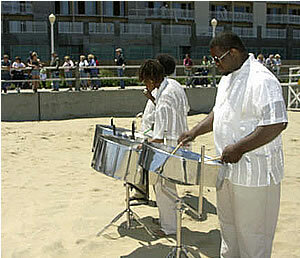 "The music was great and ALL our guests really enjoyed the band; they kept asking how I found a steel band in VA Beach. Two hours really set the tone of the evening, and the quality of the music was certainly worth the price. Again, I loved the sound; I'll clearly recommend One Love in the future."